More higher education institutions are moving to the cloud to adapt to changing needs and meet modern-day expectations of students and employees. Asking employees to change the way they do their jobs can be challenging. Once deployed, customers tell us their employees—who may have been using paper-based processes and outdated administrative systems—are delighted with their Workday experiences. Create an internal campaign to promote the change. This might include short phrases that are catchy, memorable, resonate with the institution’s culture, and can be included on educational materials and signage. One institution used the theme “Discover Workday,” as the word “discover” held particular meaning for that institution. Train a small group of evangelists prior to full deployment. These power users will become advocates and can be the go-to people in their departments as the broader population starts using Workday. Begin product demonstrations and education early. One institution kicked off the transition with a series of on-campus tours, where a small group from the college gave a high-level overview and demo of Workday to different departments. Have a real, physical place where people can go for information about the deployment. Set aside a place—a conference room, part of the break room, or whatever is available—as an information center. This demonstrates to employees that the institution is committed to the transition, and provides a regular place for them to visit to learn more throughout the deployment process. Respond to resistance by emphasizing the bigger picture. It can be hard for people to change what they’ve done for many years, even when the end result will benefit the entire community. When dealing with resistance to changes, ask employees to consider how change will improve students’ experiences. That should also be the guiding light when re-evaluating business processes as part of the deployment. Talk to partners and consultants during testing. Encourage employees involved in the testing phase to ask questions of partners and consultants while they are on campus. Customers told us departments that engaged with partners and consultants during this time transitioned more easily than those who didn’t. Empower employees to take ownership and self-serve. With outdated administrative systems, users have had to depend on IT when they needed help. Educate users that moving to the cloud gives them more ownership over business processes and data, which can empower them in their jobs (and allows IT to focus more on strategic work). Throw a party! Positioning the change as a celebration of great new things to come is an easy way to generate excitement and set the tone for the future. 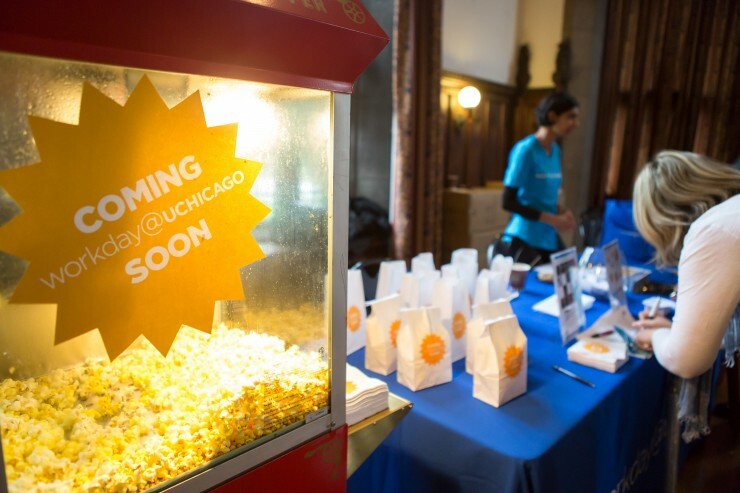 The workday@uchicago booth at the Benefits & Health Fair on the University of Chicago campus, October 2014. Thanks to our panelists at the University of Rochester event for these great tips for success. We’d love to hear your thoughts and ideas.